Almeyda effect: Also called the Higuera response. A remarkable phenomenon in which a foreign manager — with no knowledge of the Mexican league or it’s players — can sometimes improve a club’s condition simply because the person has the expectation that it will be helpful. Expectation plays a potent role in the Almeyda effect. The more a person believes they are going to benefit from a treatment, the more likely it is that they will experience a benefit. Club Guadalajara’s 2015 Apertura season ended the same way as the previous with a three-nil defeat at home against Santos. Except last season Chivas match against Santos was in the Liga MX semifinals and the ‘Green-and-Whites’ went on to win the Clausura 2015 Championship. This time around Santos was a shadow of their former selves winning only four games and failing to qualify to the league playoffs by finishing in 15th place of the table. Santos even reached the Omnilife stadium with manager Pako Ayestaran having presented his resignation claiming the clubs dismal season was his fault and only managing the game as a formality. For Guadalajara losing against Santos was a harsh reminder of the club’s relegation problems. A few weeks earlier Chivas had managed to win the Copa MX, the club’s first championship in nine years, with manager Matias Almeyda proclaiming that “a giant has awakened.” Chivas, however, turned out to be a paper giant failing to qualify to the league playoffs while stringing along a poor run of results. The arrival of Almeyda was at the behest of Chivas General Director Jose Luis Higuera who had become disillusioned with Jose ‘Chepo’ de la Torre’s management of the team. “Being last place of the table with 7 points, be it Chivas or whomever, it is not sane to be in last place. Having a relegation problem just makes things more difficult,” said Higuera of his decision to replace De la Torre. Almeyda’s whirlwind arrival, winning five straight league and cup games, made him a fan favorite. The golden haired Argentine appeared to be the best thing to happen to the club since dutch legend Johan Cruyff was hired with the illusion of turning Chivas into the next F.C. Barcelona. After seven months Vergara scraped the Cruyff project and any ideas of assimilating the Catalan giants. 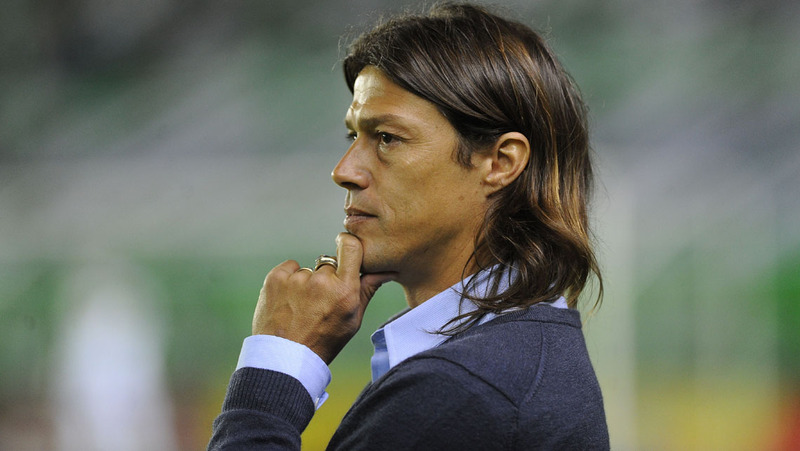 Having missed out on the Liga MX playoffs Almeyda now finds himself in a similar predicament. The expectation and excitement created by Almeyda’s early success and cup win have dissipated with the clubs dismal form which should be worrisome. In Chivas last six games of the season the team only managed to win once, 1-0 against crosstown rivals Atlas, with three defeats and two draws. While Almeyda’s ‘attacking philosophy’ proved good enough to win the Cup tourney, which most club’s take with stride, it has proven to be a disaster in league play. Being outscored at home by club’s that had a worse season has even made Almeyda question his players commitment. “It is difficult (to know what the players are thinking) because I can’t get inside their heads but their attitude was not the correct one,” a frustrated Almeyda told reporters after the Santos defeat. “Chivas fights against an economic powerhouse of players costing the club three times more. We are conscious of that and will not just look for name players but those we have observed that can reinforce the squad. At the very least we need three or four players, one for each position,” finalized Almeyda. Next season will be brutal for Almeyda, as Chivas will be facing another uphill relegation battle, and more than reinforcements the Argentine will need the support and confidence from the club’s volatile owner and meddling director to be allowed to properly manage the team. Other than that he will most likely be sacked by match week 5 just in time for a new savior coach to be appointed. Next season will be brutal for Almeyda, as Chivas will be facing another uphill relegation battle, and more than reinforcements the Argentine will need the support and confidence from the club’s volatile owner and meddling director to be allowed to properly manage the team. Other than that he will most likely be sacked by match week 5 just in time for a new placebo coach to be appointed.